There's a reason why we call this the Mega Bounce. This bounce is so big that it looks like it ate two other bounce houses for lunch. We can't prove it, but we think it did. It is a must have for any large event. We can fit twice as many kids in it, and there's still tons of room for them to bounce around! Until you see it, you don't understand what we mean when we say 'Mega' Bounce. Maximum occupancy 15 people or 1,500 lbs. I know you are curious just how big our Mega Bounce is. You know there is only one way to find out. 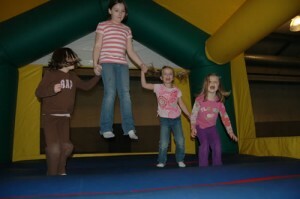 Rent our Mega Bounce for your next event or party and make everyone’s jaw drop, including yours. 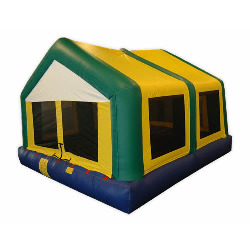 This bounce house perfect for events that have a slightly larger audience. The small bounces only allow 3-4 adults, but this one can fit twice that. It’s one big bounce house. If you are planning on renting Game Craze’ Mega Bounce, then get out your tape measure. You need to spend a little time making sure that this bounce house rental will fit. Just because you’ve fit other bounce houses in that same space, it doesn’t mean this one will fit. It is much larger in every direction. But don’t worry, our Game Craze staff will help you make the right decision for your big event.